Every day we see new Smartphones in the market, most of them are not mentionable due to similar designs, specs and other features, still, we love the pace of technology in mobile phones and now and then whenever a new mentionable phone appears we review it. Today we will be reviewing Turbo 5 by InFocus, a U.S. based company that has brought this new treat for Indian customers. This phone has two variants priced at Rs 6,999 and Rs 7,999. A budget phone with super specs and features. InFocus has entered the Indian market with Foxconn a global leader in electronics manufacturing in the consumer business, their partnership together will surely bring an array of innovation in technology solutions. Now let’s look all the features that InFocus has brought to you in Turbo 5, which will be available for public on Amazon from 4th of July. It does not have the plastic body that I usually dislike and with good design and finish the shining metal body will surely give you ample of goose bumps when you hold the phone. It looks so classy and elegant with Mocha Gold colour that gives an exclusive look and feel. You might think that the weight of the phone will be heavy due to big battery mAh, but it only weighs 164 gm, and it shows how incredibly this phone is manufactured. It also has a curved glass display that will give you a comfort of using it with a single hand even if the screen size is 5.2 inches wide. The 2.45mm narrow frame design will enable you to use this phone seamlessly. The two variants of Turbo 5 comes with different RAM and internal memory. The starting range of Rs 6,999 variant has 2GM RAM + 16GB ROM and Rs 7,999 variant comes up with 3GB RAM + 32 GB Internal memory. The OS which is pre-installed will be Android Nougat 7.0, and it has tons of features that will give this phone an extra edge over many other latest Android smartphones in the market. The 13MP back camera has an auto-focus feature that will ensure good crisp quality photos and a selfie camera of 5MP will amplify the beauty of all those self-portraits you want to take. Turbo 5 has the advanced technology in fingerprint recognition which let users unlock the phone in less that 1 sec and the enhanced security is surely worth this cool device. This Fingerprint mobile feature has become a very useful addition in mobile market, using this feature you not only have ample security but also satisfaction. I have seen many best smartphone below 8000 and InFocus Turbo 5 beats them all in its powerful features and specs. 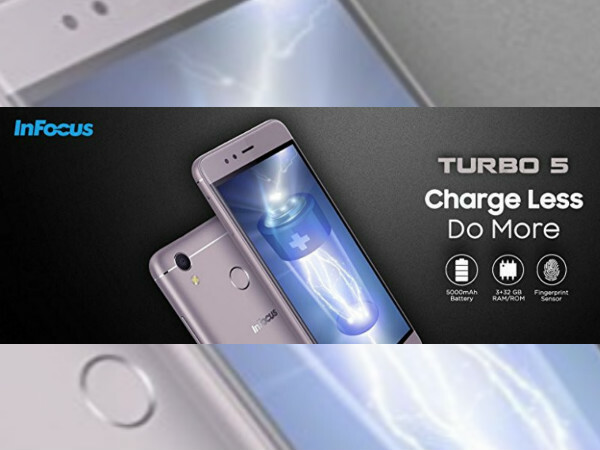 So, if you have planning to buy a budget smartphone that has 4G mobile capabilities and powerful battery life then you should opt Turbo 5 without a doubt.